No matter where you live or how you get your water in the Navarro Watershed, there are things you can do to improve the reliability of water for you and your community, as well as the health of our streams and wild salmon runs – and the Navarro Partnership has the solutions and tools to help you do it. 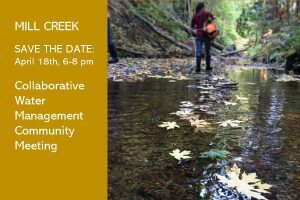 Support the development of flow enhancement projects including water storage, groundwater infiltration, habitat restoration and coordinated stream diversions. It is the nature of our Mediterranean climate that there is always more water available during the winter when it rains and less water available during the summer when we have months of dry weather. Our water use, however, follows an opposite pattern. In the Navarro we use 82% of our water during the summer. Taking water when stream levels are naturally low, threatens water supplies for both people and salmon. With such strong demand during the least water abundant time, drinking and irrigation water can run out, and rivers can dry up, destroying salmon and steelhead habitat. The problem is timing: Water is severely limited when we need it in the summer and fall. And this situation is only intensifying due to climate change, which is increasing temperatures and the frequency and intensity of droughts. 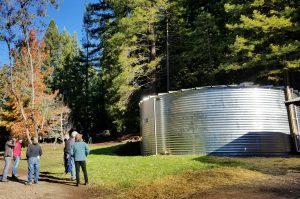 There is good news: Throughout the course of a year, there is enough water overall to meet the water needs of people, farms and fish in the Navarro River watershed. In fact, on average, farms and homes use only about 1% of the total water runoff. So, to improve water security for people and fish, we must reduce reliance on summer diversions and meet more of our water supply needs using water stored during winter and spring. Water Storage: Store wet season water for use in drier months to reduce your need to take water from the river in the summer – specific options include: diverting stream water or rainwater capture during the wet season and storing in ponds or tanks. 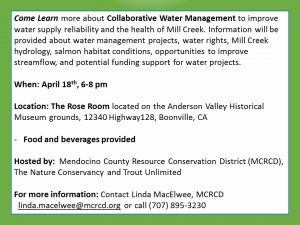 The water challenges facing communities in the Navarro River watershed are the result of many things: historic land use practices, on-going development and hundreds of streamflow diversions which have left little water in the summer and fall to meet the needs of people, farms or fish. There is no silver-bullet or single project solution for our streams. It has been near death by hundreds of cuts and it will be life by dozens of projects. The only recipe for success is one where landowners work together to do whatever they can – no matter how large or small – to reduce reliance on summer diversions, store water from the wet season and increase groundwater infiltration. Recognizing the need to work together, we developed what we are calling Collaborative Water Management – a watershed approach incentivizing individual water users to collectively and voluntarily implement projects and management efforts to improve their water supply reliability and instream flows for fish.